Free camping, giant dunes, and a ghost town too! If you want free camping near Great Sand Dunes National Park, here’s one good option. This Colorado boondocking spot along Lake Como Road is near enough to the park that it’s easy to visit. 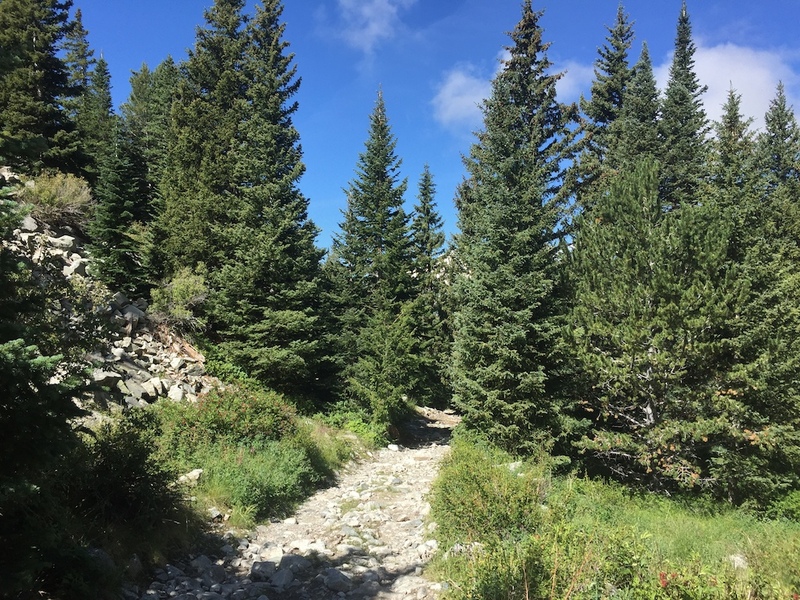 But instead of paying for the official campground, here you get a free campsite with wide open views, and hiking access into the Sangre de Cristo Wilderness. Those who are energetic can use this as a base for climbing the three local peaks that are over 14,000 feet high. Or if you’re like me, there’s a cool old ghost town to explore! The road into this boondocking area is known as Blanca Road, Lake Como Road, or Road 5410. Blanca Peak is one of the prominent “14er” peaks in this area. Lake Como, high in the mountains and by the border of the Wilderness, is the endpoint of the road/trail. Watch the naming and numbering here. Most maps will show the road as #5410, and I saw a sign for “Blanca Road”. It seems that in 4WD circles, “Lake Como Road” is a preferred name. I also saw this spot named “Sacred White Shell Mountain” on one website. How confusing! When you turn off the paved highway road onto this graded dirt road, you’ll see a big open stretch of BLM land. Just drive up the road in the direction of the mountains, and you’ll see some obvious places where people have camped before. When I was there, the first large site was occupied. The second was down in a bit of a dip, so had no cell service. I continued on to the third (about a mile up the road from the turnoff), where my cell service returned. This was home for the night! The road starts out pretty good, but it gets worse and worse the further up you go. I think there was one more site beyond me where I’d feel comfortable taking Zennie, and another couple after that where we could probably make it but I’d be worried. Big rigs may want to stay closer to the beginning of the road. If you’re looking for easier access and more facilities, check out San Luis Lake free camping, not far away. That one’s easy for any rigs. It’s super quiet here. The main paved road doesn’t get too much traffic, and where I was camped, I didn’t hear any traffic noise. Valley views on the hike up. Zennie is a tiny white speck down there! I set off just as it was getting light one morning, aiming for a ghost town that I’d read about. It was pretty chilly that early, but with the threat of afternoon thunderstorms, I wanted to get moving soon. The road/trail starts climbing right away, as it winds its way into the foothills of the mountains. 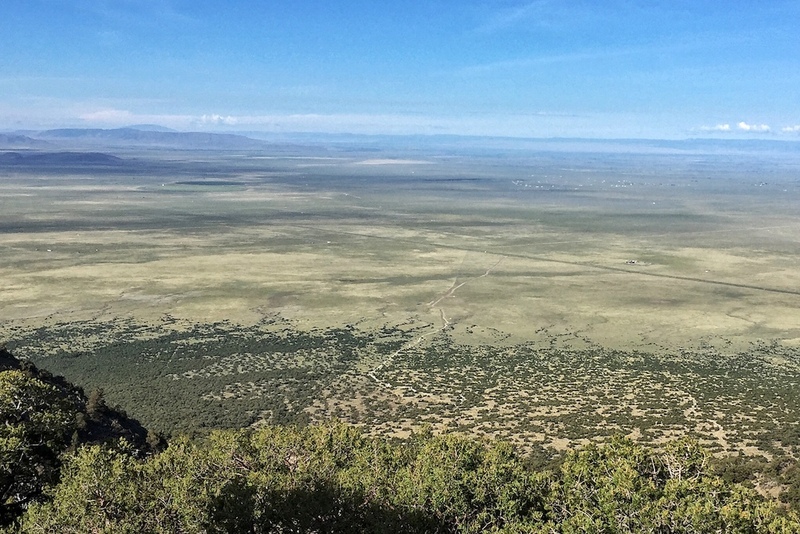 There are expansive views out over the San Luis Valley, and Zennie shrank to a minuscule dot as I went higher. Every once in awhile, I’d see somebody’s Jeep parked by the side of the road, showing the point where they decided to give it up and walk the rest of the way. Lake Como Road is supposedly the 4th most difficult 4WD road in Colorado. And that’s saying something! Even serious vehicles can’t make it through. While hiking, I met a guy driving up in a shiny new Tacoma that still had dealer plates. He explained to me that the hellish noise it was making was its super special rock crawling mode, which he was eager to put to the test on one of the toughest roads in the state. Frankly, I was relieved when he soon passed me heading back down the hill, having given up on the venture. I would have hated to see that gleaming new truck damaged on one of its first outings! Just another gorgeous hike in the Colorado mountains! Personally, hiking is my mode of choice. I trust my own legs to take me places that even a rock-crawling Tacoma can’t go! If you want to climb one or more of the 14ers, you can backpack in from Lake Como Road, and set up a camp higher in the mountains. During the summer, afternoon thunderstorms are very common over the high peaks, so be prepared to start very early in the morning. One woman told me she started at 230am in order to reach the top before the rain. Yikes! But I was aiming for the ghost town of Commodore, and after about 4.5 miles, I came to the first remnants of it. 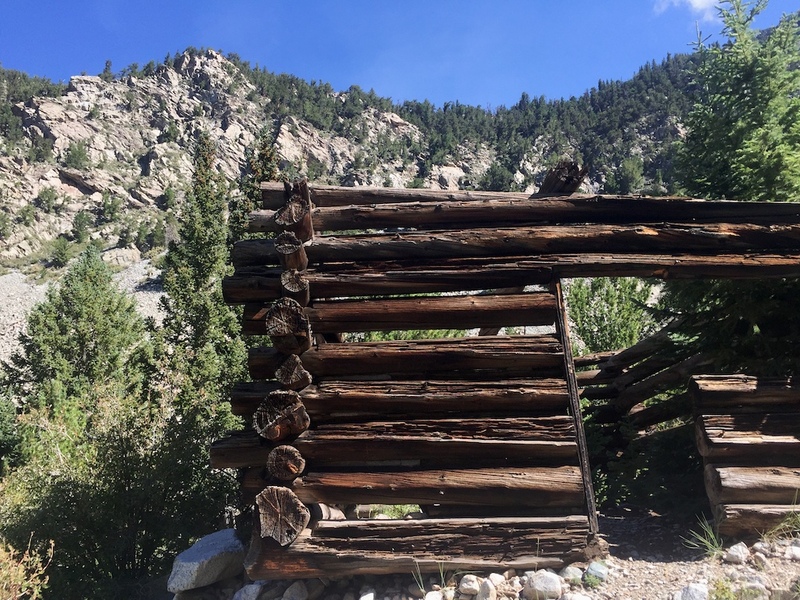 The town still has at least eight log cabins in various states of disrepair. All the roofs were gone, but there was enough left of the walls to visualize how things used to be. 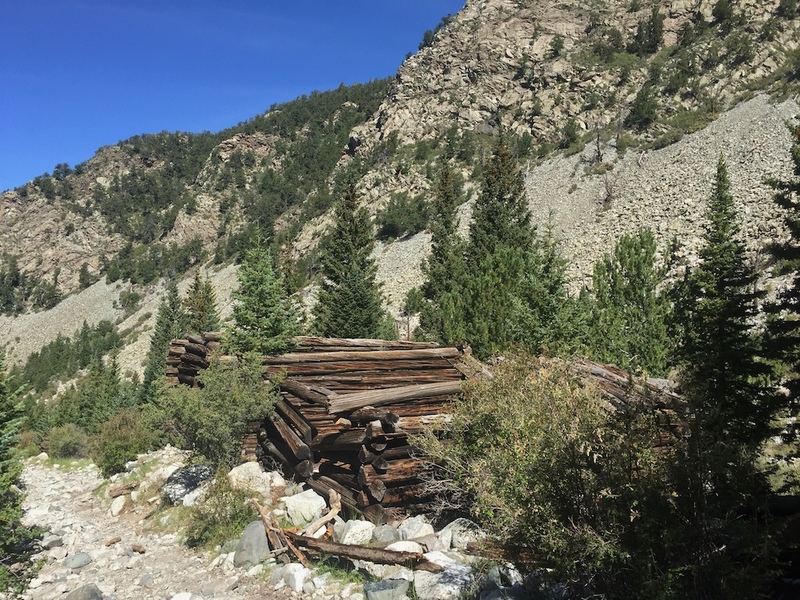 This ghost town was high in the mountains, over 10,000 feet. There’s a stream flowing near it, and the vistas here are of mountains that stretch ever higher. During the summer, this is a very pleasant place, but it must have been wickedly cold during the winter. A log cabin stands roofless in the ghost town of Commodore. Boondocking campsite. 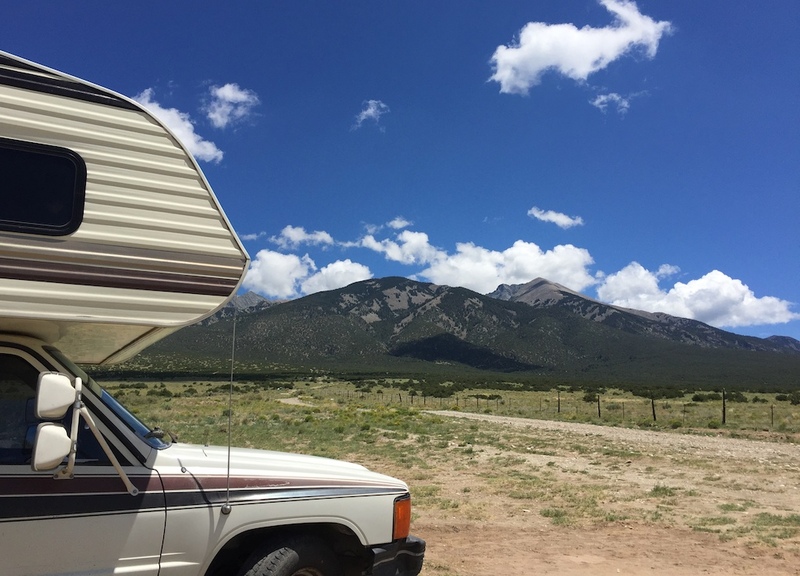 Free camping near Great Sand Dunes in Colorado, with hiking into the Sangre de Cristos. Tons of space, but the road deteriorates the further you go. No facilities, good cell service in places.